At a recent truck camper gathering, we were struck by how everyone not only had a favorite camping chair, but also a favorite camping table. Even more amazing was how many different camping chairs and tables were on display, and how passionate some of the folks were about their particular camping chair and table choices. 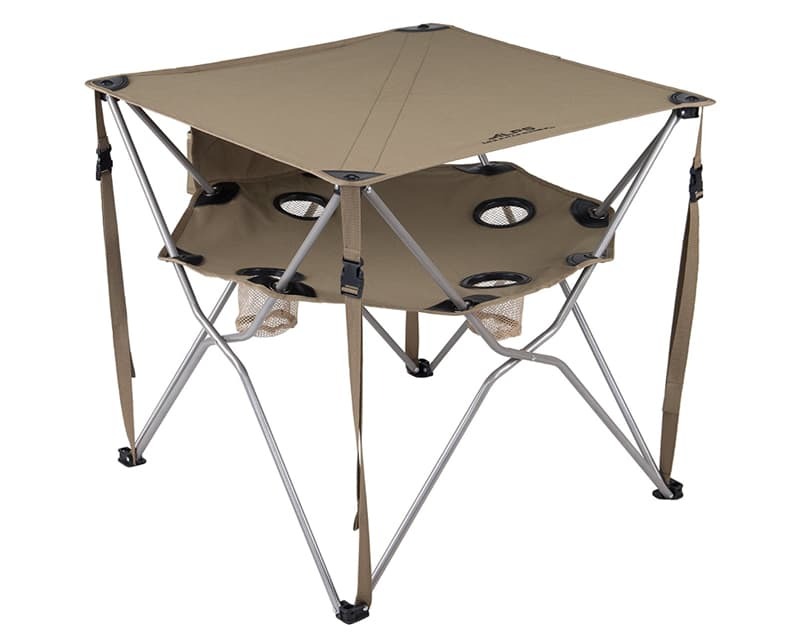 We have already addressed the most comfortable camping chair question in a previous Question of the Week, but what about camping tables? 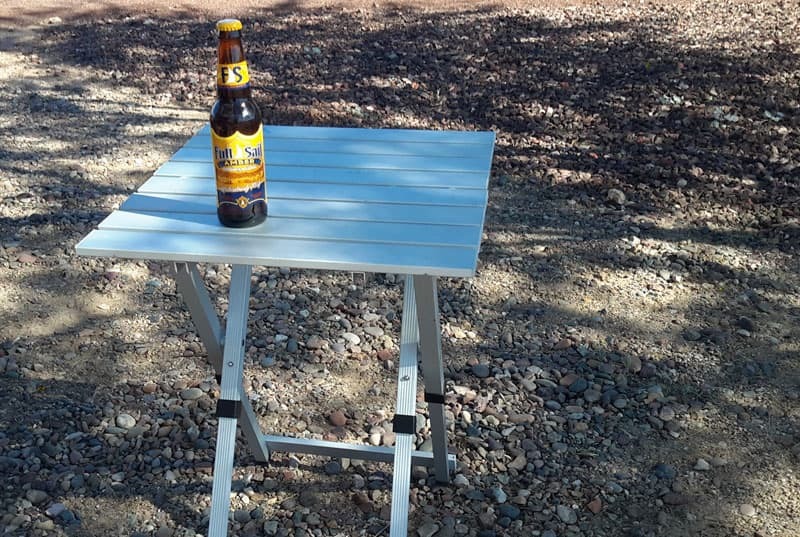 This week’s Question of the Week was, “What is your favorite portable camping table?” As a bonus, we also asked readers for their favorite beer. “I’ve had numerous plastic folding tables, like the kind you find at Camping World. They’re not real sturdy and end up scratched and dingy looking. I found an aluminum table at REI called the Rio Adventure. It’s very lightweight, has extendable locking legs and when it’s folded the bottom support brace becomes the carry handle. I store it under my dinette table next to the wall with my Weber BBQ. The BBQ fits perfectly on the table. The table is also a good resting place for my favorite beer. “The ALPS Mountaineering Eclipse Table wins the prize for portability. It folds up and stows in a sack smaller than most camp chairs. However, the table is not rigid. It’s more like a stiff trampoline, so it would not be a good idea to sit beverages or spill-ables on top unless you’ve got a desire to be baptized with your beverage of choice (you know who you are). Fortunately, this two-level table has four beverage holders on the basement level, as well as extra storage space. Handy, and definitely hip! For an engineering feat that yields a table strong and rigid enough to eat a four-course meal with beverages, ALPS Mountaineering comes to the rescue once again with their dining table. 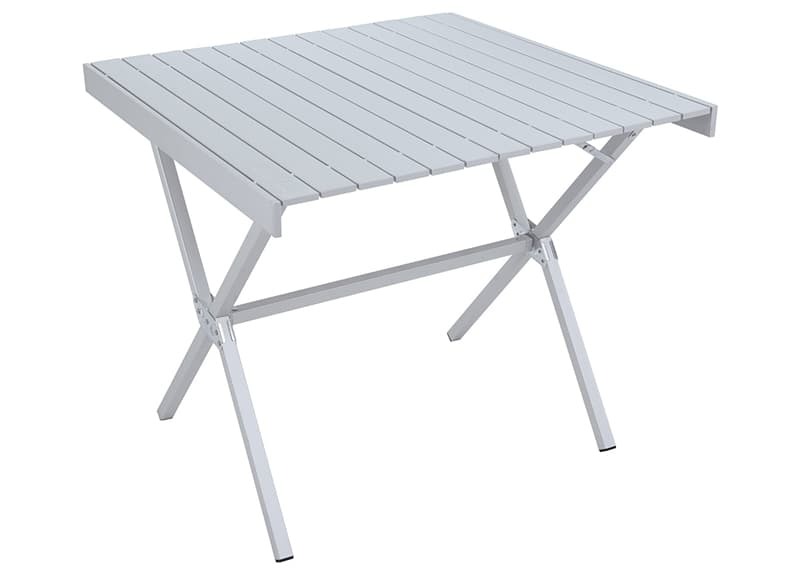 This aluminum marvel is available in three sizes, and each one folds into a 5″ x 7″ package, with length determined by the table length (31″, 43″, or 55”). The largest one only weighs 14 pounds, with the others weighing proportionately less. Reviews recorded are strongly positive. This one’s a gem for storing and utility. If the Starship Enterprise had folding tables, they’d look like these. 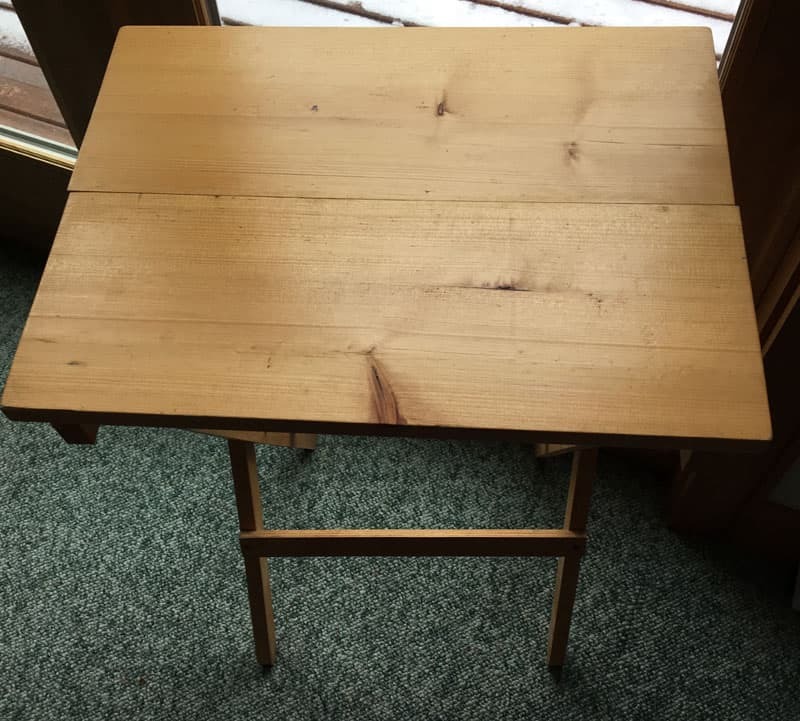 “Our portable camping table is one that my husband custom made. It is tray table size, but folds differently. It will hold our grill. I also have an ironing surface that is framed to fit on the table.